I have one question. About Hierarchical dropdown, Is it possible to display level2 or level3 terms without submitting? any new release updates on this plugin? should be this spring. Have you got any exact things you want to see in the next release? Hi, Is it possible to construct an URL that will run filter? For example http://myshop/com/?tag="mytag"&brand="mybrand"
There main reason is that I want to create a menu that will only allow subset of products to be seen. For example all black dresses. I could then just create a link with filter in it. To answer my own question—yes. One has to use “slug” as search term. I already have a website oranonline.in/ If you visit the website, you’ll find that there is a filter table on the home page that does the logical filtering of the products and do pagination. When you select options from First field, second field shows filtered options from field one. After you select an option in field 2, field 3 displays attributes filtered with both of the above options. in the pagination happens. Currently I am using a complex JS and all. I want to create this homepage with help of your plugin. Please confirm the possibility. hello i tried the free version and i have a problem. The texts for the radio buttons and the checkboxes line up if they are too long. So the button is all alone with the text below. It is very unsightly. Is there a way to solve this? How can I change title label ? Question, when you sort by color is it possible to only show the product colors in the results? If I sell t-shirts in multiple colors and they just want to see the red shirts. Can it filter and show only the red shirt graphics? Unfortunately, this plugin does not affect the display of products. My client needs to filter their products by multiple categories (and their childs) Such as, color, style, functions. Do you have a simple solution for this, or this code? hiya! That simple… totally overlooked that option… Thank you! I have a shop for carparts. Each carpart is available for different makes and models. They are product variations so you have to select the atributes once you are on the product page. What i want to archive´is the following: The customer selects his car form the attributes filter “Make” for example “Ford” there can be several sublevel atributes as for example “B-Max” so in for the second attribute there should only be attributes selectable from producs which also have the attribute “Ford”. Also when i click the link to the product the attributes should be preselected. Is this possible? Also when i click the link to the product the attributes should be preselected. – Unfortunately not. Предполагаю Вы знаете русский язык. Hi there, I have purchased the premium version and am trying to use the Essential Grid extension. 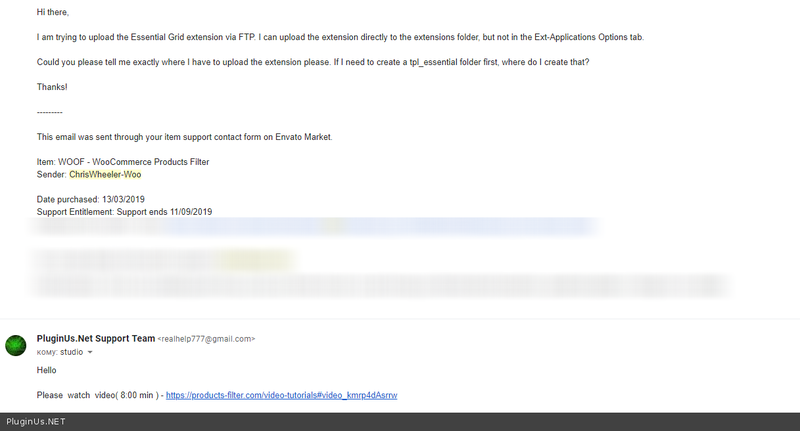 I’ve uploaded the extension and the filter is on my page using the widget. Everything looks okay, but the filter itself isn’t working – the grid just repopulates with all content. Do you have an email address for support so I can send url, admin login etc? I tried to contact support from here but didn’t hear anything. Hey there, thanks for that. I watched the video and it answered my first question. I have the Essential Grid extension uploaded and the filter appears on the page, but it’s not working. I have to use it as a widget, if I add shortcode: [woof_products per_page=8 is_ajax=0 tpl_index=tpl_essential] I only see a box that says ‘default sorting’. I will send another message via Item Support and hopefully we can resolve this issue. Hey there – no problem, I figured out what I was doing wrong. I didn’t realise I needed to add the shortcode as well. All working now, thanks for your response. The widget I created is not visible on Category pages. How can i fix it. Hi, I just sent you an email. Thx. Is it possible to set separate options depending on the website version? 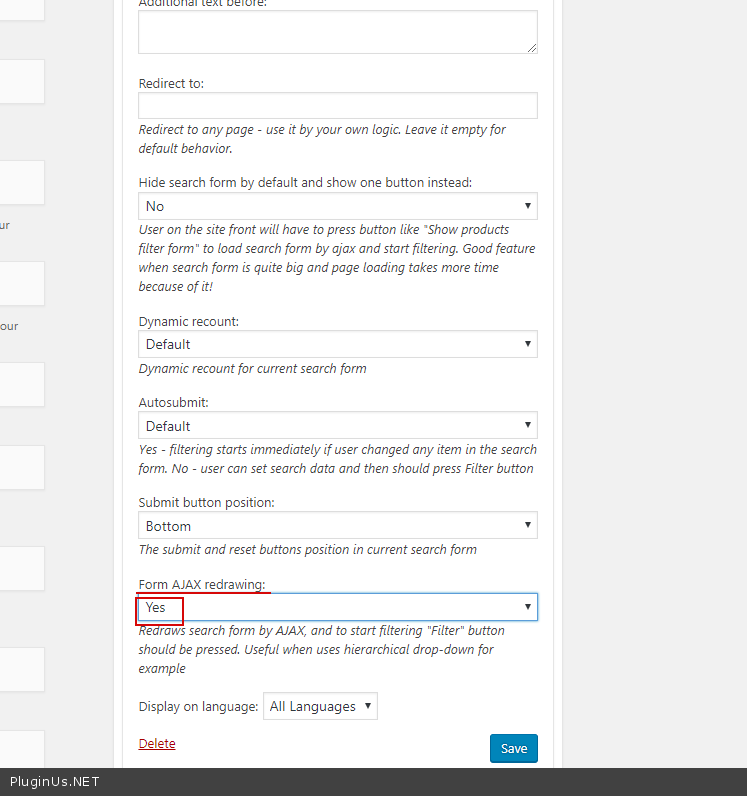 for mobile version – drop-down for the full version – checkbox? Maybe somehow using woof_is_mobile? Hello. I am trying to figure out how I can make it so that a parent category isn’t selectable and only a title. For instance, I have the Parent category, “Gender/Age,” But I would not like this to be selectable (or at least impact results) I would only like the user to be able to select the child category of Women, Men, or Children. I am using a checkbox filter. How can I achieve this? Thanks! I’m using your free version to filter by Custom Taxonomies. It works fine. But, I would like to automatically hide (ajax) the terms when there are not product associated with them. Can I get this with your (this) premium version? Hi! Presale question! 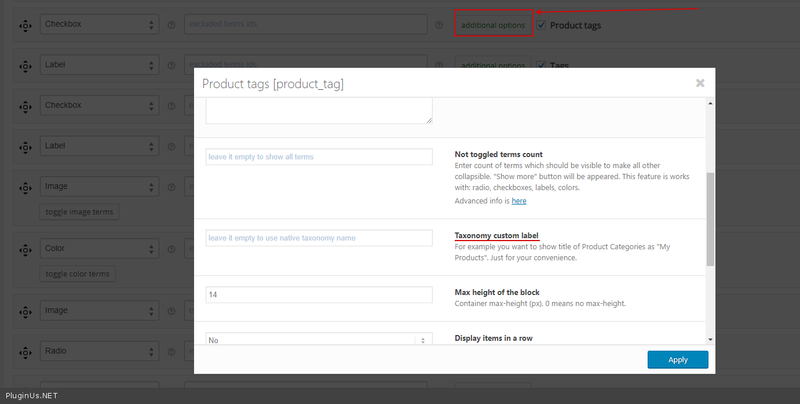 I need to filter some products with meta data and i would like to get an automatic range for the slider. This is exactly the same thing than the price : if i have 3 products with a meta field “abc” and values going from 10 to 30, the range of the slider will automatically go from 10 to 30. If i add a new product with 100 in the “adc” field, i would like to get a range slider from 10 to 100 automatically. Is it possible with your plugin ? This is obviously not possible with the free version, is it possible with the paid one ? Does the premium version require a new installation? Or can i activate the free/trial version as a premium version? Since i have had someone made some changes to the way its being shown on my shop. So don’t want to lose those changes. Also visual changes? I had someone move the entire filter content to the top of my shop. But don’t have the code for it. it showing on google chrome and mobile but I am trying to make it on an android webview app the whole page will not load. is there some kind of options for this issue.